The Thomas Fire spread through the hills above Ventura, in the northern greater Los Angeles megalopolis, with the speed of a hurricane. Driven by 50 mph Santa Ana winds—bone-dry katabatic air moving at freeway speeds out of the Mojave desert—the fire transformed overnight from a 5,000-acre burn in a charming chaparral-lined canyon to an inferno the size of Orlando, Florida, that only stopped spreading because it reached the Pacific. 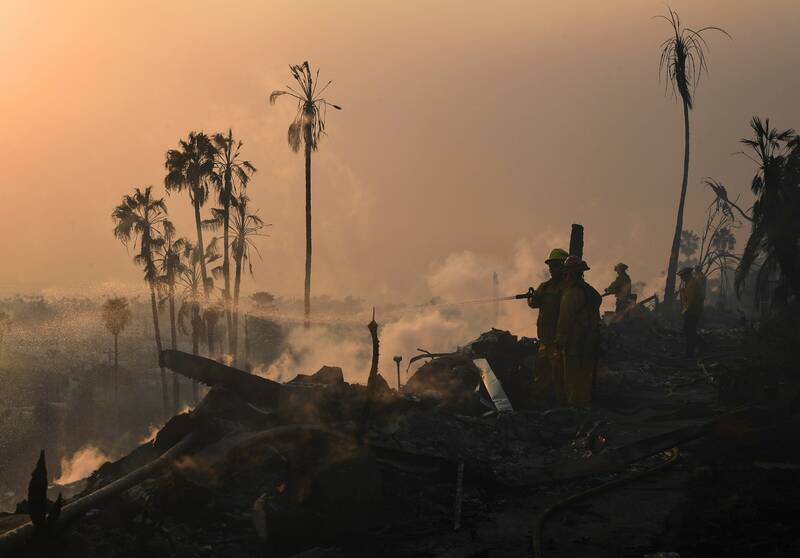 Tens of thousands of people evacuated their homes in Ventura; 150 buildings burned and thousands more along the hillside and into downtown are threatened. That isn’t the only part of Southern California on fire. The hills above Valencia, where Interstate 5 drops down out of the hills into the city, are burning. Same for a hillside of the San Gabriel Mountains, overlooking the San Fernando Valley. And the same, too, near the Mount Wilson Observatory, and on a hillside overlooking Interstate 405—the flames in view of the Getty Center and destroying homes in the rich-people neighborhoods of Bel-Air and Holmby Hills. And it’s all horribly normal. Southern California’s transverse ranges—the mostly east-west mountains that slice up and define the greater Los Angeles region—were fire-prone long before there was a Los Angeles. They’re a broken fragment of tectonic plate, squeezed up out of the ground by the Pacific Plate on one side and the North American on the other, shaped into the San Gabriels, the Santa Monica Mountains, the San Bernardino Mountains. Even the Channel Islands off Ventura’s coast are the tippy-tops of a transverse range. Santa Anas notwithstanding, the transverse ranges usually keep cool coastal air in and arid desert out. Famously, they’re part of why the great California writer Carey McWilliams called the region “an island on the land.” The hills provided hiding places for cowboy crooks, hiking for the naturalist John Muir, and passes both hidden and mapped for natives and explorers coming from the north and east. The problem is not fire. The problem is people in the wrong places. Fires don’t burn like this in Northern California. That’s one of the things that makes the island on the land an island. Most wildfires in the Sierra Nevadas and northern boreal forests are slower, smaller, and more easily put out, relative to the south. (The Napa and Sonoma fires this year were more like southern fires—wind-driven, outside the forests, and near or amid buildings.) Trees buffer the wind and burn less easily than undergrowth. Keeley says northern mountains and forests are “flammability-limited ecosystems,” where fires only get big if the climate allows it—higher temperatures and dryer conditions providing more fuel. Climate change makes fires there more frequent and more severe. Southern California, on the other hand, is an “ignition-limited ecosystem.” It’s always a tinderbox. The canyons that cut through the transverse ranges align pretty well with the direction of the Santa Ana winds; they turn into funnels. “Whether or not you get a big fire event depends on whether humans ignite a fire,” he says. And there are just a lot more humans in Southern California these days. In 1969 Ventura County’s population was 369,811. In 2016 it was 849,738—a faster gain than the state as a whole. In 1970 Los Angeles County had 7,032,000 people; in 2015 it was 9,827,000. “If you look historically at Southern California, the frequency of fire has risen along with population growth,” Keeley says. Though even that has a saturation point. The number of fires—though not necessarily their severity—started declining in the 1980s, maybe because of better fire fighting, and maybe because with more people and more buildings and roads and concrete, there’s less to burn. Like most fresh-faced young actors in Southern California, the idea of dense development is a relatively recent arrival. Most of the buildings on the island on the land are low, metastasizing in a stellate wave across the landscape, over the flats, up the canyons, and along the hillsides. In 1960 Santa Paula, where the Thomas Fire in Ventura started, was a little town where Santa Paula Canyon hit the Santa Clara River. Today it’s part of greater Ventura, stretching up the canyon, reaching past farms along the river toward Saticoy. So the canyons are perfect places for fires. They’re at the Wildland-Urban Interface, developed but not too developed. Wall-to-wall hardscape leaves nothing to burn; no buildings at all means no people to provide an ignition source. But the hills of Ventura or Bel-Air? Firestarty. As the transverse ranges defined Southern California before Los Angeles and during its spasmodic growth, today it’s defined by freeways. The mountains shape the roads—I-5 coming over the Grapevine through Tejon Pass in the Tehachapis, the 101 skirting the north side of the Santa Monica Mountains, and the 405 tucking through them via the Sepulveda Pass. The freeways, names spoken as a number with a “the” in front, frame time and space in SoCal. For an Angeleno like me, reports of fires closing the 101, the 210, and the 405 are code for the end of the world. Forget Carey McWilliams; that’s some Nathaniel West stuff right there—the burning of Los Angeles from Day of the Locust, the apocalypse that Hollywood always promises. It won’t be the end end, of course. Southern California zoning and development are flirting, for now at least, with density, accommodating more people, dealing with the state’s broad crisis in housing, and incidentally minimizing the size of the wildland interface. No one can unbuild what makes the place an island on the land, but better building on the island might help stop the next fires before they can start.